Gait belts, or transfer gait belts, are excellent tools that help facilitate patient transfer, decreasing incidence of caregiver back injuries when transferring incapacitated patients (Source). Patients wear these mobility assistance devices to help them be transferred in and out of beds, vehicles, chairs as well as keeping them steady when moving to other areas in the home or medical center like the bathroom or bedroom. The devices are intended to be used in conjunction with a robust fall management program to ensure patient and caregiver safety (Source). In general, you will find that a gait belt is around 1.5″ to 4″ wide and 54″ to 60″ long. The belt is constructed from durable nylon, canvas, or leather with a buckle at one of its ends. Oftentimes, a healthcare provider can help decide which gait belt is the best to use- so, by all means, consult with a physician prior to purchasing. Designed to prevent caregiver back injuries while aiding people. Constructed from machine washable cotton material (no natural rubber latex.) so that it's easy to clean. Employs universal belt sizing to facilitate the transfer of individuals of all age groups and weight ranges. Let's take a look at our five favorite gait belts. What are customers saying about gait belts? What are some common uses of gait belts? When shouldn’t you use a gait belt? 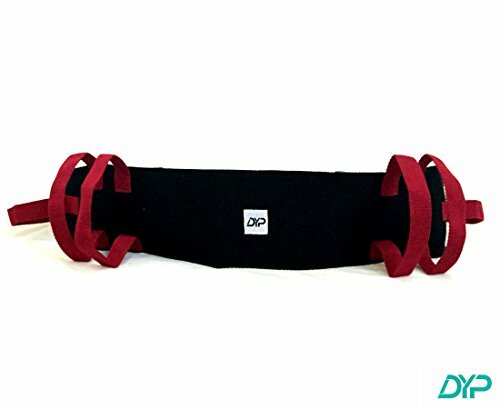 Avoid back injuries when lifting or assisting patients with the help of this gait belt. It is specially designed for total fall management as an aid in walking, lifting or transferring a resident or patient. This makes the work of caregivers easier. Some notable features of this belt include multiple horizontal and vertical hand grips for customized leverage point. With a dimension of 52 by 4 inches, it is wider than average gait belts, which allows for greater contact area when handling patients. It fits waists measuring 28 to 52 inches. Many users gave this product positive feedback. With many pleased customers, there is little doubt that this product is a good buy. This gait belt provides caregivers and attendants with a firm grip of the person being lifted or assisted. The 4-inch back support as well as the two horizontal and four vertical handles makes it easy for the user to adjust the belt to the user’s comfortable position. When the gait belt is in use, it stays in place with minimal movement. It comes with a quick-release buckle and fits waists from 28 to 52 inches. 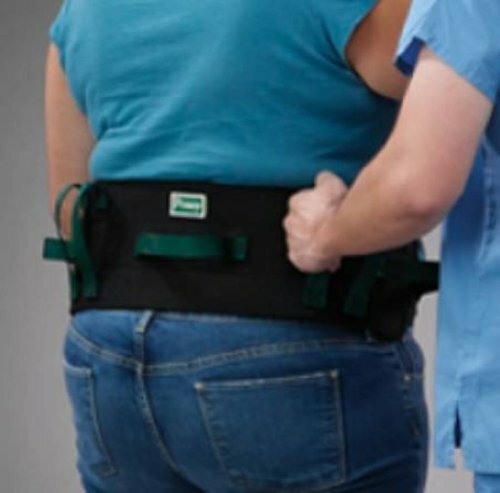 Caring for a heavier person is easier for caregivers with the help of this gait belt. This gait belt is of great assistance for people who are involved in transferring or providing ambulation assistance to residents and patients. It makes these tasks safer and more comfortable. With its durability and strong construction, you can ensure that it will not break easily. It is also made extra wide for greater contact and control over the patient. Sewn-on handles for vertical and horizontal adjustments provide customized grasping points. It comes with a heavy-duty plastic buckle with a strong snap-lock. While some users say that this belt has a tendency to slip when not properly adjusted or positioned, overall its user base is satisfied with how it has worked for them. With broad popularity within its user base, you can bet that this belt gives good value for your money. It is ideal for safely transferring patients from vehicles or wheelchairs. This 2-inch wide belt fits waists of up to 58 inches. It comes with a durable quick-release buckle and two hand grip straps. Although not very cheap, it certainly is a tough belt designed to ease the daily routine of caregivers. Some users say that they have a little difficulty in adjusting and positioning the belt. But once it is done, it works as it should. 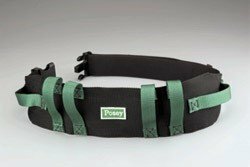 Transferring and lifting a patient will be safer and easier with the help of this strong and ergonomic gait belt. Made from cotton polyester, it is comfortable to wear and easy to clean. It has a set of vertical and horizontal handles for firm grip. Setting it up and using it should not be a problem. It measure 4 inches wide while the length extends from 28 inches to 60 inches. Each of the handles measures 9 inches, giving the patient enough room for grabbing the belt comfortably. A heavy duty buckle that is easy to fasten holds this belt in place. Many caregivers and home care therapists were particularly impressed by the handgrip loops as well as the ease of putting the belt on and taking the transfer gait belts off the patient. These belts have been lifesavers for a number of people. One satisfied customer on Amazon reported that without the belt they would not have been able to lift their elderly mother off of the floor after she had fallen. These devices are also used in conjunction with other types of mobility aids like walkers or four wheel rollators for additional security and stability purposes while individuals are moving. Gait and walking belts are used for a variety of different medical conditions including for individuals who have had hip or knee replacements, are elderly or infirm, suffer from dementia, and any other ailment that affects mobility. Another satisfied user reports that her mother in law “now has handles”. She had been trying to help her mother-in-law get in and out of the wheelchair, get onto the toilet, move her to her recliner as well as transporting her to her bed, but she ended up hurting her back in the process. With a gait belt she is now able to do a lot of the lifting she wasn’t able to do before without injuring herself. As well, she no longer receives unintentional bruising from her mother-in-law who would frequently grasp at her during the transfer process. Some gait belts have emergency quick-release buttons users found particularly helpful. Make sure you examine the gait belt extensively prior to purchase to ensure that it meets your requirements. Also, it’s a smart move to check out the warranty prior to purchase. Gait belts are exceptional devices for handling individuals suffering from mobility impairments. When an individual is suffering from an impairment of mobility, they will typically lack of coronation and motor control abilities. There are some people with mobility impairments to can use a wheelchair or a walker to navigate themselves what they need to go. Many people experience mobility impairments on account of paralysis, cerebral palsy, and amputation, on account of a severe traumatic injury. Gait belts are medical devices that many caregivers use in nursing homes as well as private residences to move patients around more easily. The primary aim of a gait belt is to facilitate patient movement while diminishing caregiver physical strain. Homebound patients who are under hospice care often use gait belts. They are simply constructed. The belt’s body is usually constructed of a cotton material with some synthetic strengthening fibers used. These are exceptionally sturdy fabrics that are easy to clean. There will be a strong metal belt buckle on one and that will enable the user to secure it tightly in place on a patient. To use the gait belt is fastened around the waist and to avoid discomforting the patient, the caregiver places 2 fingers between the belt and the body of their patient to make sure the fit is not too tight. Gait belts can be useful in transitioning people into wheelchairs from their beds, moving them into dining chairs, facilitating bathing, and other common home activities. Sometimes it will require more than one caregiver to move an individual using one of these devices- in that case it can still be important assistive medical transfer solution. Sometimes gait belts are not the best solution– in the case where individuals are attached to IVs then it is not advised to use a gait belt with these patients. Anytime a patient is tied or encumbered by a medical device, it is not a good idea to use a gait belt to transfer them. If you are looking for a gait belt for sale, or wondering ‘where can I buy a gait belt’, consider purchasing online- e-retailers have great pricing options and diverse product selection if you are in the market for a transfer gait belt, even one that is personalized. If you are a caregiver for an elderly relative, a senior citizen etc., and consider purchasing one of these gait belts that we have reviewed. 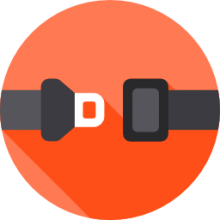 First make sure that the individual you are taking care of is medically qualified to be transported using one of these belts. Ensuring the safety of the elderly or disabled person you are caring for his the primary concern.